A 45 year old male chronic alcoholic while under effect of alcohol was beaten with kicks and punches by two males. 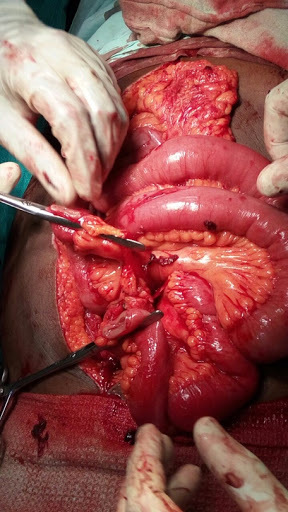 The patient had severe abdomen pain but he didn't go to a medical facility. 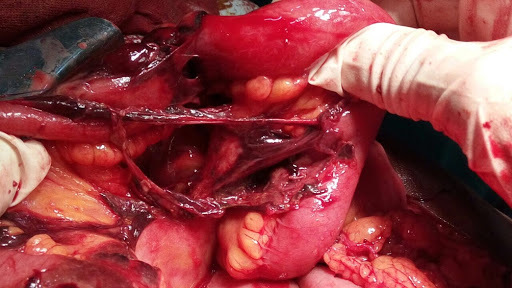 Two days after sustaining this blunt trauma to the abdomen he presented to emergency with persisting abdomen pain, abdominal distension, fever and decreased urine output. But initially he gave a vague history of self fall while walking and did not give any clear history which suggested force of trauma. At presentation, patient was hemodynamically stable but his Blood urea was 116 mg/dl and his Serum Creatinine was 2.8 mg/dl. Postoperatively after 12 hours the urine output normalized and renal parameter came back to normal.